I first blogged this just under a year ago and as it is once again cold and horrible outside, I thought I'd repost it. However, this is an updated and, ahem, souped up version, before any of you accuse me of getting lazy with the blogging! It's still one of my favourite soups. It's light and healthy, but thanks to the chilli has a real kick to it. Brilliant for seeing off those winter colds. I made this version using Udon noodles, which I love. However, I realise that they tend to be quite divisive - people seem to either love or hate them - so if you fall into the latter camp, just use Ramen as in the original recipe. I bought my Udon noodles - you should be able to find fresh or frozen ones in any good Asian grocers. 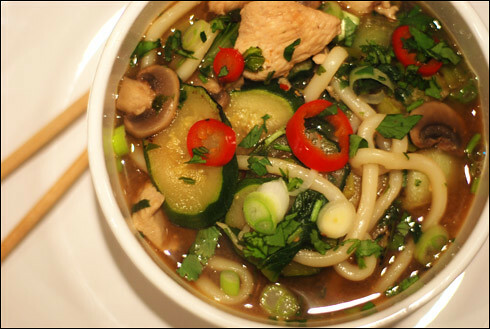 However, if you fancy taking a stab at making your own Udon noodles, the wonderful Leela at She Simmers blogged a recipe. It looks like a lot of fun too - you have to knead them with your feet! Apologies, the ingredients list is a little on the long side, but if you keep a well-stocked larder, you should hopefully have most of the non-perishable ingredients to hand. I'm not going to lie, the trick to making this dish utterly painless lies entirely in the pre-preparation. And I'm only going to tell you once - before you get cooking, get everything ready and prepared, then you're just left with the simplest assembly job known to man. It also helps a lot to be familiar with the recipe before you begin. So, add all the marinade ingredients to a small bowl and whisk together. Thinly slice the spring onion and crush the garlic and add those too. Then slice the chicken into 5mm ribbons and add to the marinade. Leave for an hour, stirring occasionally. Next, slice the courgette into 5mm slices, Do the same with the mushrooms. Roughly slice the pak choi. Slice the spring onions and the red chilli and roughly chop the coriander. Add 2 teaspoons of miso paste to the chicken or vegetable stock, and then pour a dessertspoon of olive or groundnut oil into a wok and turn up the heat. Once hot, add the courgettes and pak choi and fry for a minute. Then add the chilli and most of the spring onions. Fry for a further minute. Add the sugar snaps and mushrooms and fry for another two minutes. Make sure you're constantly tossing the ingredients with a flat wooden spoon - you don't want them to stick and burn. Now add the chicken and marinade and fry for about 3 minutes, until you can no longer see any pink showing. Add most of the coriander (you're reserving a little of the spring onions and coriander as a garnish) and then pour in the stock. Simmer for about three minutes before adding the Udon noodles, then simmer for a further three while they cook. Transfer the soup to large bowls, garnish with the remaining spring onions and coriander, and slurp immediately. I am going to make this tonight for a valentines meal, cant wait!